MIAMI — Overlooked and underestimated on the campaign trail for nearly two years, Miami Congressman Kendrick Meek on Tuesday easily beat back a profligate challenge from real estate mogul Jeff Greene to run away with the Democratic nomination for U.S. Senate. Meek, 43, is the first black Senate nominee from Florida and the only major black Senate candidate nationwide. If elected, he stands to become the Senate's lone African American. The Associated Press called Meek the winner just 15 minutes after the polls closed in Pensacola, Florida's western-most voting outpost. "There were those that counted us out, but you counted us in," a beaming Meek told hundreds of supporters at the Westin Diplomat Resort & Spa in Hollywood. He thanked everyone from God to President Barack Obama to "school bus drivers that I greeted this morning at 4:30 a.m. that know what it means to have to live paycheck to paycheck." But Meek has little time to savor defeating a brash billionaire who vowed to spend "whatever it takes." He wakes up Wednesday somewhat bruised, very broke, and polling in last place behind a national Republican superstar, former House Speaker Marco Rubio, and the sitting governor, Charlie Crist. Crist, who left the Republican Party four months ago to run as an independent, has about $8 million stashed away. Rubio has about $4.5 million. Greene, 55, said Tuesday night that he would endorse Meek and contribute to his campaign. "While this effort may have fallen short, we must work hard to ensure that the failed policies that will be pursued by the two Republicans in this race . . . cannot come back to power in Washington," Greene said in a concession speech in front of only about 35 people at the West Palm Beach Marriott. 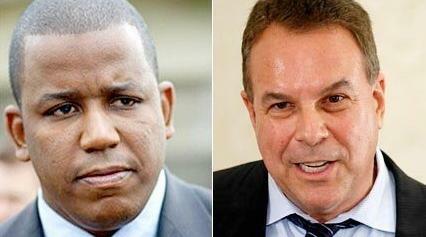 Former Miami Mayor Maurice Ferre, who had a shoestring campaign with about $220,000, ran a distant fourth. Greene spent about $25 million out of his own pocket, more than four times as much as Meek. He pummeled the Miami congressman with television spots and mailings casting him as a do-nothing, "corrupt'' career politician tied to a massive development scandal. Meek sought $4 million in federal budget earmarks for developer Dennis Stackhouse, who had paid his mother $90,000 as a consultant. The development proposed for one of Miami's poorest neighborhoods was never built, and Stackhouse was charged with making off with about $1 million in public and private loans. Meek repeatedly said he didn't know about Stackhouse paying his mother, former U.S. Rep. Carrie Meek, and that he sought the federal money to bring jobs to struggling Liberty City. For weeks, the attacks seemed to be working as Greene surged ahead of the longtime front-runner. But Meek countered with his own negative campaign in the homestretch, condemning Greene for making a fortune betting on massive mortgage foreclosures. Voters said they were also turned off by Greene's partying past and his carpetbagger status as a registered Democrat and Florida resident only since 2008.